It’s not been an easy ride for Asking Alexandria. During their rapid ascendency to the upper tier of the British metal scene, they’ve had spats, line-up changes (and quite public falling out with frontman Danny Worsnop), five full-length albums and a ton of awards. But where did Asking Alexandria come from and how did they survive the past 15(!) years? We trace five-piece back to their roots in Dubai and how they became one of the standout bands in the mid-noughties metalcore boom. Guitarist Ben Bruce and fellow Brit James Murray – expats living in Dubai – form Amongst Us, a synthcore band which would later become End Of Reason and eventually Asking Alexandria. 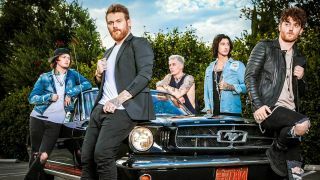 The Dubai lineup of Asking Alexandria release a 12-track debut called The Irony Of Your Perfection, which you’ve never heard for many, many good reasons. Ben moves to the UK and reforms Asking Alexandria as a six-piece with Danny Worsnop (vocals), Ryan Binns (keys), James Cassells (drums), Cameron Liddell (rhythm guitar) and Joe Lancaster (bass). Ryan leaves the band. Asking Alexandria fly to the US, buy an RV and drive back and forth across the country. The 90-date campaign launches them to the head of metal’s latest class of up-and-comers. Sam Bettley replaces Joe Lancaster in December and joins the guys in the US a month later. The classic lineup is solidified. Asking Alexandria sign with Sumerian Records and release their debut, Stand Up And Scream, in September. It peaks at No.170 on the Billboard 200. They follow with Life Gone Wild, an EP consisting of remixes, demos and Skid Row covers. Asking Alexandria play Los Angeles’ storied Whisky A Go Go for the first time. Danny tears his ankle ligaments during the first song but soldiers through a set that ends with a trip to the hospital and a bottle of Vicodin. The band embark on a world tour that includes more than 100 dates in 14 countries. Reckless & Relentless is released in April to largely positive reviews. Asking Alexandria dip their collective toe in the waters of the rock mainstream with the clean-vocal track Someone, Somewhere. Charlie Sheen invites the band to open for him on his bizarre My Violent Torpedo Of Truth standup tour in the US. Due to touring obligations, the band are forced to decline, which turns out to be a good thing – Sheen’s tour is widely regarded as a disaster. Danny and guitarist Jeff George form We Are Harlot, a riff-oriented band inspired by classic rockers like Bon Jovi, Aerosmith and Bad Company. Another huge year of touring, including the Outbreak tour with As I Lay Dying. Danny is forced to miss some dates due to a ruptured vocal cord. He recovers in time to perform with Suicide Silence at the benefit concert for Mitch Lucker. Asking Alexandria headline Brixton O2 Academy in January, which they will release as Live From Brixton And Beyond in December, 2014. We Are Harlot sign with Roadrunner and announce that they’ll record a full-length debut. Danny insists that his commitment to Asking Alexandria remains solid. In January, Danny resigns from Asking Alexandria to focus on We Are Harlot. Sumerian Records CEO Ash Avildsen suggests they check out labelmate Denis Stoff, from Down & Dirty. Denis sends over a few Asking Alexandria covers with clean vocals and joins the band soon after. The band release I Won’t Give In, their first single with Denis. Due to Denis’s visa issues, however, the band are forced to cancel their first two gigs with the singer at Manchester Academy III and London Underworld. We Are Harlot release their debut album. We say it “showcases a fiery amalgam of monster riffs, full-throttle tempos and arena-friendly choruses that erupt with blood-pumping vitality”. They win a Metal Hammer Golden God award for Best New Band in June. With Denis firmly entrenched as the new singer, Asking Alexandria kick off another world tour. In March, AA release The Black – their only record with Denis. It enters the UK Top 20 and peaks on the Billboard 200 at Number 9. In October, Ben reveals on Facebook Live that Denis has broken off communication with the band. He blows everybody’s mind by revealing they’ve already replaced him – with Danny Worsnop. On December 15, Asking Alexandria’s classic lineup release their fifth album, Asking Alexandria. You can read the exclusive story behind Asking Alexandria’s new album with Danny Worsnop back on vocals in the latest issue of Metal Hammer – on sale now. Buy it directly here or become a TeamRock+ member to read it right now. Asking Alexandria: "There was no fear on this record"